SALT LAKE CITY, UT, July 8, 2013 – River rafting aficionados need not put away their water sandals and PDF jackets quite yet, some of the best rafting this season is in store for August into late September according to the veteran river runners at Holiday River Expeditions (https://www.bikeraft.com/). 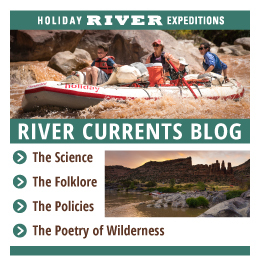 “The three best rivers for a late summer rafting getaway; Utah’s Colorado River through Westwater Canyon, the Green River through Lodore Canyon and Idaho’s Lower Salmon River Canyons are all looking excellent this year,” states John Wood, President of Salt Lake City-based Holiday River Expeditions. 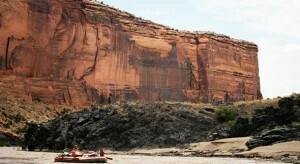 According to Wood, the Colorado River through Westwater Canyon is at its best in late season, lower water flows. In this narrow canyon the rapids actually get more pronounced as the water level recedes. “You can count on solid Class III and IV rapids well into September,” Wood explains with knowledge drawn from his nearly 40 years of experience. In the hot summer, due to ongoing agriculture and hydroelectric needs, the Green River through Lodore Canyon benefits from the steady flows coming from the Flaming Gorge Dam. Predictable and consistent flows will be the case this year from July through Sept. Plus drier weather in August and September equals clear water and better fishing. And on the Lower Salmon River in Idaho, mid-July through Sept is prime time due to more reliable weather, warmer water, larger beaches and lack of pesky bugs. One of Wood’s favorite family trips, the Lower Salmon invites water play, swimming, time in the inflatable kayaks, great side canyon hiking, improved fishing and dreamy nights due to perfect night time temperatures. To receive the $100 Off for Kids, please mention “Great Deals” when making a reservation. Holiday River Expeditions began in 1966, when Dee Holladay and his wife Sue took the plunge to become river outfitters. Due to its respect for the lands, rivers, guests and employees, the family-owned-and-operated company has grown exponentially. Each of its guides is professionally trained in first aid and river safety, and with over 47 years of experience, the company provides guests the opportunity explore the nation’s wild lands safely and securely. Holiday River Expeditions has a philosophy to protect the environment through education and conservation, and as such, uses oar-powered and paddle rafts.